Nov. 16, 2017 -- Most pregnancy-related deaths in the U.S. happen after the baby is born, what doctors call the postpartum period. “If you look at the statistics, the highest risk period that we have seen is postpartum, because that period of time is so long. It’s from the time the baby is delivered up to 1 year,” says Stacie Geller, PhD, director for the Center for Research on Women and Gender at the University of Illinois. In wealthy countries, 60% of deaths related to childbirth happen in the postpartum period. Sixty-five percent of those deaths happen within a week of delivery. Recognizing that care is still required after birth, the American College of Obstetricians and Gynecologists recently urged doctors to begin treating the postpartum period as the “fourth trimester” of pregnancy. All the traditional causes of pregnancy-related deaths, like infections, hemorrhage, and preeclampsia, still loom in the days and weeks after a woman goes home from the hospital, even as new threats come into play like postpartum depression and substance abuse. Many women fight an addiction during pregnancy to protect their developing babies, only to succumb to cravings as they return home and new life stresses begin. Yet it often happens that no one is checking on mothers in these first critical days and weeks after they come home from the hospital. Medical guidelines recommend that women get at least one postpartum visit up to 6 weeks after they have a baby. About 40% of mothers don’t make it to even that one post-birth visit. “I was going to get T-shirts made with ‘6 weeks’ with a line drawn through it. Because there’s this concept that a postpartum visit is a 6-week visit, and that’s not evidence-based,” says Kate Berrien, who directs the Pregnancy Medical Home program in North Carolina. The state began beefing up care for pregnant women treated through its Medicaid program in 2011. “One of the things we recognized is that a lot of issues need to be addressed much sooner than that,” Berrien says. For example, for women who show signs of high blood pressure before delivery, they try to follow up with them within a week after they come home from the hospital, she says. In France and the Netherlands, two countries with low rates of maternal deaths, nurses visit mothers almost as soon as they’re home from the hospital. The nurses return daily until the women and newborns are out of the woods. Calista Johnson, a 32-year-old woman who died 5 days after giving birth, left Parkland Hospital in Dallas with verbal instructions to call a doctor if she was running a fever, couldn’t eat, or had severe pain or heavy bleeding. She had a follow-up appointment scheduled 2 weeks later at a women’s clinic that’s run by the same health system. She never made it. Her family says nobody, including her, understood how serious her symptoms -- a severe headache and back pain -- were. Some U.S. organizations are working to remedy this knowledge gap. In Florida, they’re testing a new information card that women would get at the hospital where they gave birth. It would list vital information from their delivery as well as give them information about signs of trouble. The card is needed, experts say, because many women -- including Johnson -- wind up at an emergency room that’s not at the same hospital where they delivered. That can delay and complicate a timely diagnosis. 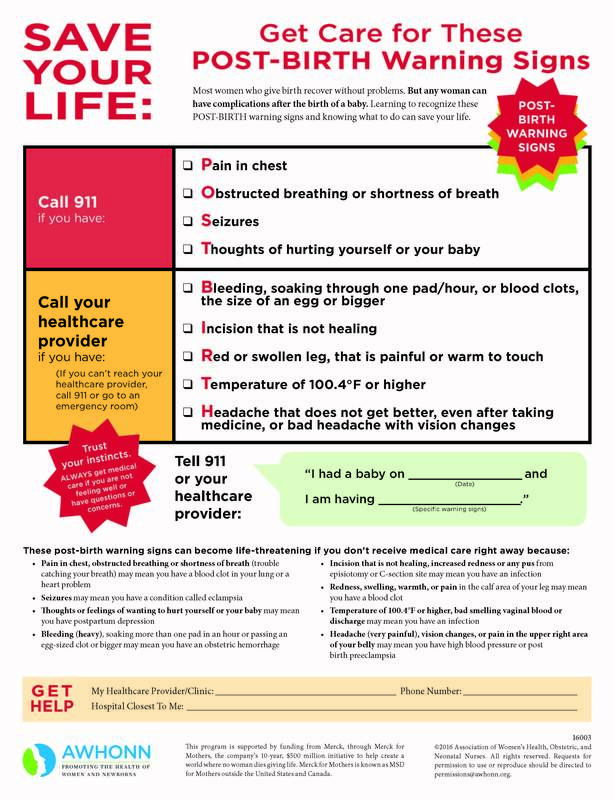 The Association of Women’s Health Obstetric and Neonatal Nurses (AWHONN) -- through its Healthy Mom & Baby website -- has come up with an important checklist for women to print out and put on their refrigerator. It details nine critical post-birth warning signs that need urgent follow-up care. “You want patients to understand that they’re still at risk, and if they have these symptoms to report them to their doctor,” says Elliott Main, MD, an obstetrician-gynecologist who is medical director of the California Maternal Quality Care Collaborative in San Francisco. Brenda Goodman produced this special report as part of a yearlong Reporting Fellowship on Health Care Performance sponsored by the Association of Health Care Journalists and supported by The Commonwealth Fund.